Period Garden Park on the News!! Check out this WSJ article and related video about Period Garden Park and Joe Bonardi's work! City of Madison Parks website. City of Madison Parks: Rules for Park Shelter Reservations City of Madison Parks website pages concerning regulations for events and activities for all city parks. Period Garden Park is an alcohol free park. Sorry, dogs are not allowed. Period Garden Park is featured on the "Neighborhood Parks Success Stories" page! Madison Parks Foundation has the mission of supporting neighborhood groups to raise funds to make improvements in Madison parks and public spaces. Independent of the City Parks Division. Gates of Heaven is located in James Madison Park, less than a block away from Period Garden Park. 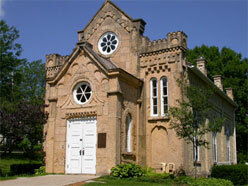 This historic structure is available for weddings and events. www.capitolneighborhoods.org Capital Neighborhoods, Inc., an organization dedicated to improving the experience of residing in Madison's vibrant downtown. www.madisonpreservation.org The Madison Trust for Historic Preservation is a nonprofit organization established in 1974 to help preserve the architectural and historical heritage of the greater Madison area through advocacy and education. www.mansionhillinn.com Mansion Hill Inn Bed and Breakfast offers its guests the luxury, elegance and Victorian charm of Madison's only four-diamond inn. https://allencentennialgarden.org/ Allen Centennial Gardens, located on the UW-Madison campus at 620 Babcock Drive. www.olbrich.org Obrich Gardens is another one of Madison's fine garden parks. Madison Park Hours: Monday - Sunday, 4:00 a.m. to 10:00 p.m.